Following the death of Queen Katherine Parr in September 1548, Lord Seymour didn’t even wait for his wife’s funeral before he returned to London. 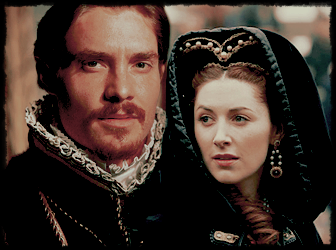 As he was free to marry Lady Elizabeth Tudor again, Seymour went straight to her for the second time. Seymour bombarded Elizabeth with letters, lent her his house in London, and coerced her governess Kat Ashley into pleading his case on any and every occasion possible. Of course, Elizabeth refused to comply, a move that probably kept her from being beheaded herself. In his head, Seymour had a grand plan for himself and had acquired ten thousand men and was preparing for a military coup. As things started to go awry, Seymour refused to wait. He took a gun and broke into the private quarters of the King. On his way to the King, the boy King’s spaniel awoke and started to bark. Seymour shot the dog and the whole household was awoken. Seymour was arrested, thrown in the Tower, and accused of 33 charges of High Treason and misdemeanor. 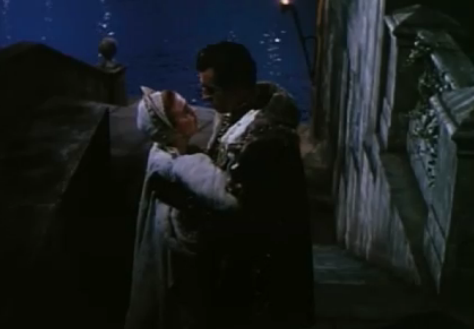 Death scene of Queen Katherine played by Deborah Kerr and Stewart Granger as Thomas Seymour in “Young Bess” (1953). 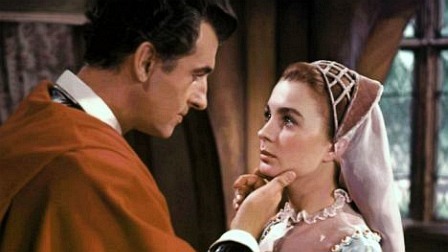 Kerr had a strong resemblance to the real Queen Katherine. The authorities had thrown everything they could at Seymour. They even accused him in a possible connection to the death of his wife, the Dowager Queen. That ‘he helped to her end to hasten forth his other purposes.’ Seymour was never given a trial before his peers. Instead, an Act of Attainder (the same legal process that had be used to rid Henry VIII of Katherine Howard) was introduced to Parliament. It passed unopposed in the House of Lords on 25 February, and in the House of Commons on March 5, where it was only opposed by a handful of members. He was sentenced to death; his own brother signed his death warrant. Later it was said that his fate was sealed by the Duchess of Somerset, Anne, who had threatened to leave her husband if he did not act against his own brother. Whether or not that is true we do not know. It may simply be speculation. On the even of his death, Seymour requested his daughter should be given into the care of the Dowager Duchess of Suffolk, Katherine Willoughby. A few days later, Lady Mary Seymour, who was now about seven months old, was taken from Syon House (home to the Lord Protector and his wife, Anne) to the Duchess’s home — Grimsthorpe Castle in Lincolnshire. Upon the death of Mary’s mother, Queen Katherine, she had left all her wealth and possessions to her husband. Therefore upon his execution, Seymour’s wealth and possessions (which included that which he inherited by the Dowager Queen) reverted to the Crown and there was no money for his daughter. 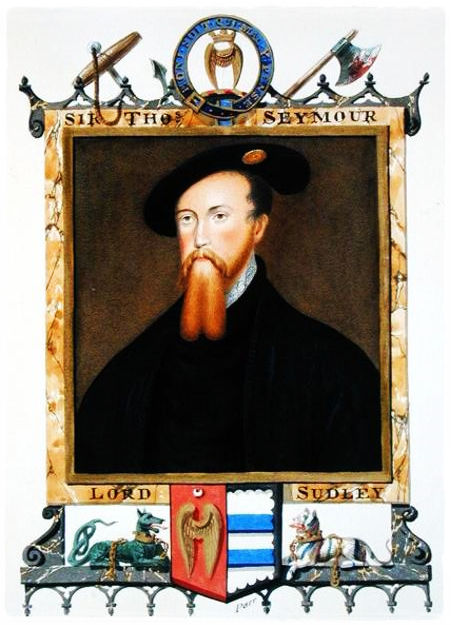 Seymour was executed early in the morning of 20 March 1549. It took two blows of the axe to sever his head. He was buried in St. Peter’s Chapel in the Tower of London where other royals like Anne Boleyn, Lady Salisbury (the last Plantagenet “Princess”, daughter of the Duke and Duchess of Clarence), and Katherine Howard had been buried. Seymour’s own brother, Somerset (Edward), would join him in January of 1552 after his own execution under Edward VI; two uncles in one reign. Linda Porter. “Katherine, the queen,” St. Martin’s Press, 2010. Susan James. “Catherine Parr: Henry VIII’s Last Love,” The History Press, 2009. This entry was posted in The Family of Katherine Parr, The Tudors (1485-1603) and tagged execution of Lord Seymour, execution of Thomas Seymour, lord seymour, Thomas Seymour by tudorqueen6. Bookmark the permalink.